q-PCR analyses of MTDH expression levels in the GC MKN45, BGC823, HGC803, AGS, and SGC7901 cell lines and the normal gastric mucosal GES-1 cell line. q-PCR was performed using SYBR Green I Master Mix (Bimake). qRT-PCR assay of mRNA level of SOSTDC1 in clinical samples. SYBR Green qPCR Master Mix is purchased from Bimake. (C-J) qRT-PCR assay was performed to detect changes in mRNA expression of some genes involved in NF-κB signaling pathway after transfection of DPCR1 shRNA plasmids in PANC-1 and MIA PaCa2 cells. SYBR Green qPCR Master Mix is purchased from Bimake. Solanine A suppressed the mRNA expression of pro-inflammatory cytokines and chemokines in LPS/IFNγ-stimulated RAW264.7 cells. Cells were pre-treatedwith different concentrations of solanine A and BAY 11-7082 (5 μM) for 2 h, and then stimulated with LPS/IFNγ (0.5 μg/mL and 20 ng/mL) for 24 h. (A) The mRNA levels of TNF-α (A), IL-1β (B), IL-6 (C) and CXCL9 (D) were measured by qRT-PCR, GAPDH was used as an internal control. ** p < 0.01, *** p < 0.001 vs. LPS/IFNγalone, n = 3. The mRNA expression level of TTP in lung adenocarcinoma cells by qRT-PCR. The SYBR Green qPCR Master Mix is purchased from Bimake. (A-C) qPCR analysis of mRNA isolated from (A) MDA-MB-231, (B) U87, or (C) HT1080 cells. Graphs show relative expression of LPAR1, LPAR2, LPAR3 and LPAR4 mRNA in copy number. RPLP0 was used to normalize the data (n = 3 independent experiments). (c) HBE16 cells were pretreated with APS (200 μg/ml) for indicated times. The mRNA expression of LL-37 was measured by RT-qPCR. The LPS (1 μ g/ml) group was used as the positive control. SYBR Green qPCR Master Mix is purchased from Bimake. (A-I) Comparison of cell death‐related gene expression among UC3 cells with control (ctrl), melatonin (mel), VPA and combinatorial (comb) treatment by qPCR. The data are presented as mean ± SD, n = 3. *P < 0.05 vs. control, **P ≤ 0.01 vs. control, and ***P ≤ 0.001 vs. control. Using the same cDNA template and primers to amplify GAPDH, Bimake 2x SYBR Green QPCR Master Mix amplified faster with stronger fluorescence signal and better amplification efficiency than other brands. Using the same cDNA template and primers to amplify RPL37, Bimake 2x SYBR Green QPCR Master Mix shows accurate quantitation with high stability. Failure to amplify low-copy targets can be due to lack of sensitivity and/or specificity. Bimake 2x SYBR Green QPCR Master Mix uses a new type of hot-start enzyme which reduces non-specific amplification at low temperature, improving amplification of low-copy genes. Bimake™ 2x SYBR Green qPCR master mix utilizes a special performance-enhanced Taq DNA polymerase protected via a hot-start activation technique, and optimized qPCR buffer system to perform SYBR Green I based quantitative PCR. 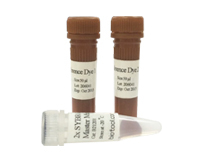 The mix, prepared at 2x reaction concentration, can be directly used for robust and low-template quantitative PCR with high sensitivity, specificity and reliability. Store at -20°C for up to 2 years. Repetitive freeze-thaw cycles should be avoided. It is recommended to pre-aliquot the mix into small batches for frequent usage. Product quality is guaranteed under proper storage conditions.